It’s Friday night. I’m on the couch in pajamas, eating pizza, alone, catching up on my DVR backlog. If time-traveling 20-something Wendy were to appear right now, she would die. Oh, the horror! Friday night. At home. Alone. Current Wendy could not be more content. I used to consider it a failed weekend if I didn’t have something fun to do both nights. “Fun” = going out, unless I were having a party or some kind of social gathering at my abode. Now that would kill me. Or at least leave me exhausted and in need of a weekend. Today a quiet weekend at home with Ruby Dogwonkafonka is one of my favorite things, and if I go too long without one I get twitchy. What a difference 10 or 20 years makes. It’s convenient that I’m happy staying in, since at the moment I don’t have a lot of extra dough for going out. 20-something Wendy, I blame you – if you had stayed in a little more, maybe we’d have more cash reserves now – see, this is all your fault! This awareness of what is and is not old seems to be one of the universal stupidities of young people. I remember saying things like, “I’m sooooooooooooo olllllldddddddd” when I was 25. Or 27. Or 32. And I hear/see on Facebook people in their 20s and 30s say things in this vein all the time. And now, I realize how stupid they sound. They’re not old. They’re aware of the passage of time for maybe the first time ever, but they’re obviously not old. And there’s no getting this message through, because they think they know everything. Now that I’m in the middle and looking both directions, I don’t at all assume I know everything – that is one thing I have learned. You think you do, and then you get older, and you realize how stupid you were when you thought that. There seems to be a lot of realizing how stupid I was. It’s amazing that our parents don’t roll their eyes at us more often than they do. I can’t wait to see what I’m doing now that makes me laugh at 40-something Wendy ten or twenty years from now. One pattern we seem to repeat is in thinking that our generation has it sooooooo much harder than any previous generation, and nobody understands our experience, and we are so maligned by the generation ahead of us. And then we get older and turn on the generation behind us because they’re whiny and they feel maligned and misunderstood. Except you’re not actually anti-the generation behind you, you just wish they understood all the things they could be learning from the benefit of your experience and hindsight instead of waiting 20 years for their own hindsight, but hi, they’re young and know everything. Hamster wheel. It’s not about the label. All young people are stupid. And not in their own way. In EXACTLY THE SAME WAY EVERYBODY ELSE WAS, BUT JUST A LITTLE BIT WORSE, because internet. And someday you will get really, really, really old (like, 42) and you will realize what an idiot you were in your 20s, and you will see it in all the people who will currently be in their 20s, and you will laugh, and you will understand your parents better, and everything will be fine. But my 40s are great. So far, anyway. Another cliché proves itself to be true: so far every decade is better than the one before. I’m not so hung up on stuff like what do people think or what everyone else is doing. I’m less concerned about “should”; I’m more interested in what makes me happy. I remember clearly the night that happened, too. I had been invited to a going away party for some casual friends who were moving. The time had come to get myself together and as I was walking upstairs to change clothes, I realized I didn’t feel like going, and then it clicked that I didn’t have to. So I didn’t. I stayed home, and it was so nice that I started refusing invitations more often. I got way more selective about whom I spend time with. If I spend time with you now it’s because I really want to. I’m not sure why it took me so long to catch onto that one. I thought I had a funny cartoon set aside about aging or clichés or something along those lines to accompany this, but I can’t find anything in my “hold” folder. 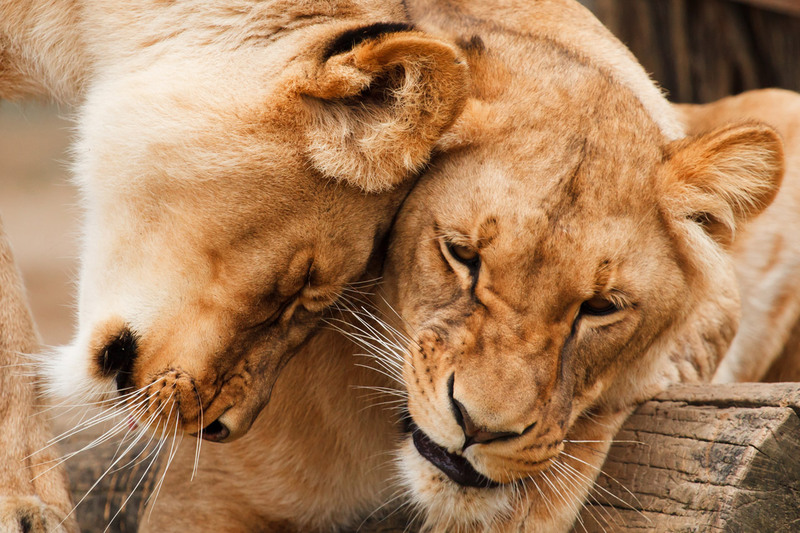 What I did find is this picture of snuggling lions. I have no idea what I saved it for, but it’s adorable, so what the hell. When I find the cartoon, I’ll save it for the lion post that clearly I intend to write some day. This is a great message! Being a twenty-something is absolutely crazy, I’m excited to see where I am in 10 years. That’s great to hear! Feel free to check out my blog for my perspective on these years. That feeling the first time you realize that you “don’t have to” go out – pretty amazing! I repeat. I think it should be published somewhere because it’s so right!